1. 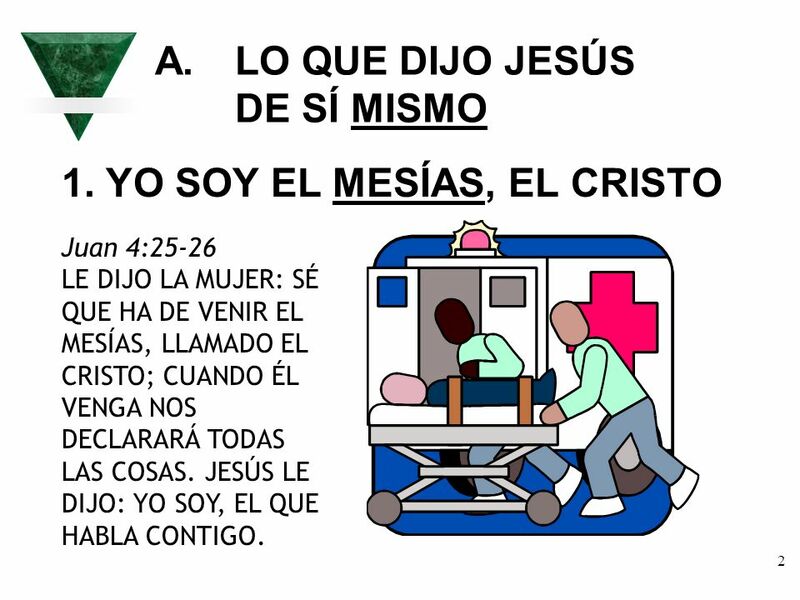 YO SOY EL MESÍAS, EL CRISTO Juan 4:25-26 LE DIJO LA MUJER: SÉ QUE HA DE VENIR EL MESÍAS, LLAMADO EL CRISTO; CUANDO ÉL VENGA NOS DECLARARÁ TODAS LAS COSAS. JESÚS LE DIJO: YO SOY, EL QUE HABLA CONTIGO. 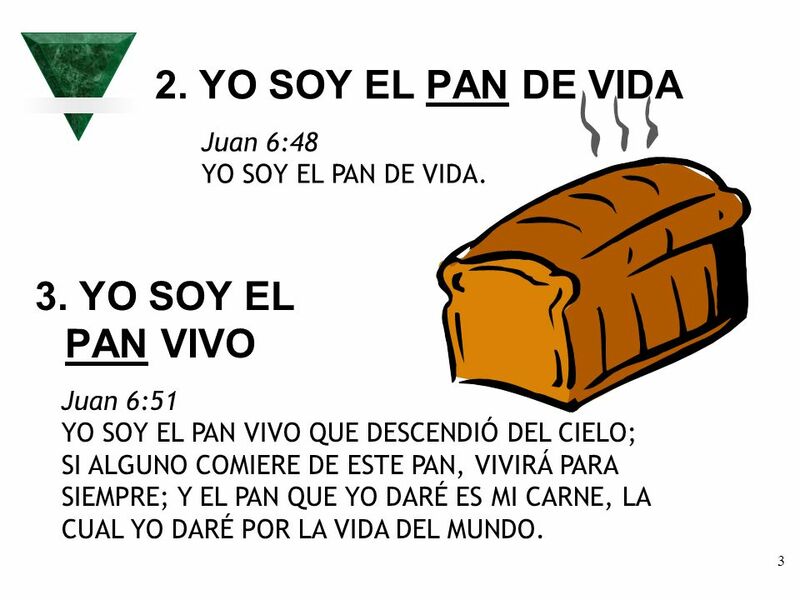 Juan 6:48 YO SOY EL PAN DE VIDA. 3. YO SOY EL PAN VIVO Juan 6:51 YO SOY EL PAN VIVO QUE DESCENDIÓ DEL CIELO; SI ALGUNO COMIERE DE ESTE PAN, VIVIRÁ PARA SIEMPRE; Y EL PAN QUE YO DARÉ ES MI CARNE, LA CUAL YO DARÉ POR LA VIDA DEL MUNDO. 4 4. 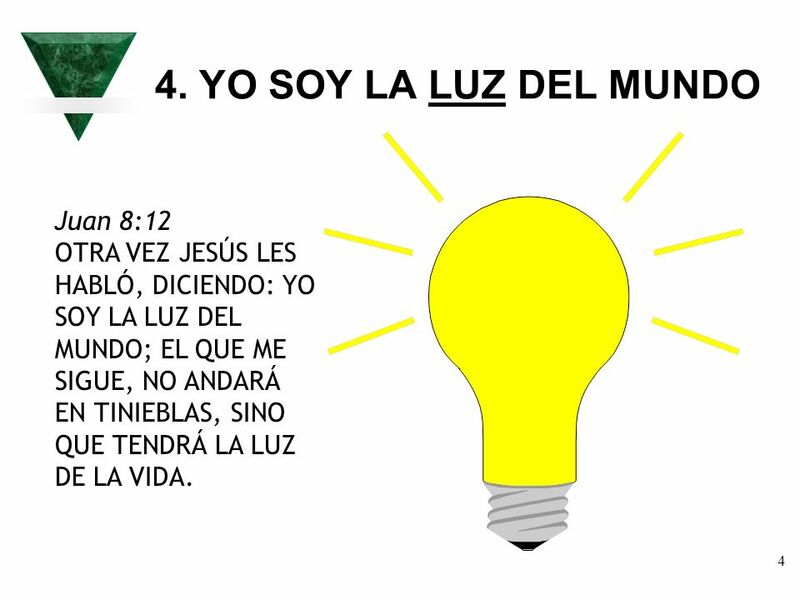 YO SOY LA LUZ DEL MUNDO Juan 8:12 OTRA VEZ JESÚS LES HABLÓ, DICIENDO: YO SOY LA LUZ DEL MUNDO; EL QUE ME SIGUE, NO ANDARÁ EN TINIEBLAS, SINO QUE TENDRÁ LA LUZ DE LA VIDA. 5 5. 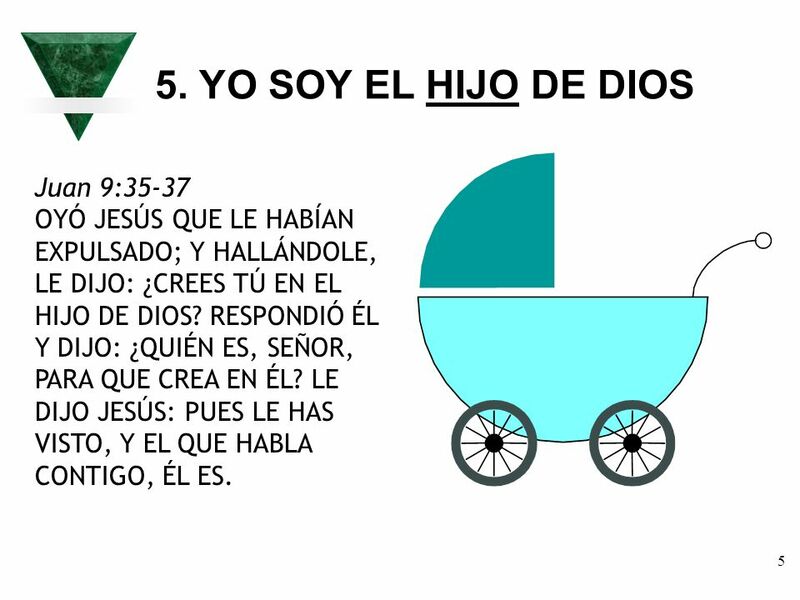 YO SOY EL HIJO DE DIOS Juan 9:35-37 OYÓ JESÚS QUE LE HABÍAN EXPULSADO; Y HALLÁNDOLE, LE DIJO: ¿CREES TÚ EN EL HIJO DE DIOS? RESPONDIÓ ÉL Y DIJO: ¿QUIÉN ES, SEÑOR, PARA QUE CREA EN ÉL? LE DIJO JESÚS: PUES LE HAS VISTO, Y EL QUE HABLA CONTIGO, ÉL ES. 6 6. 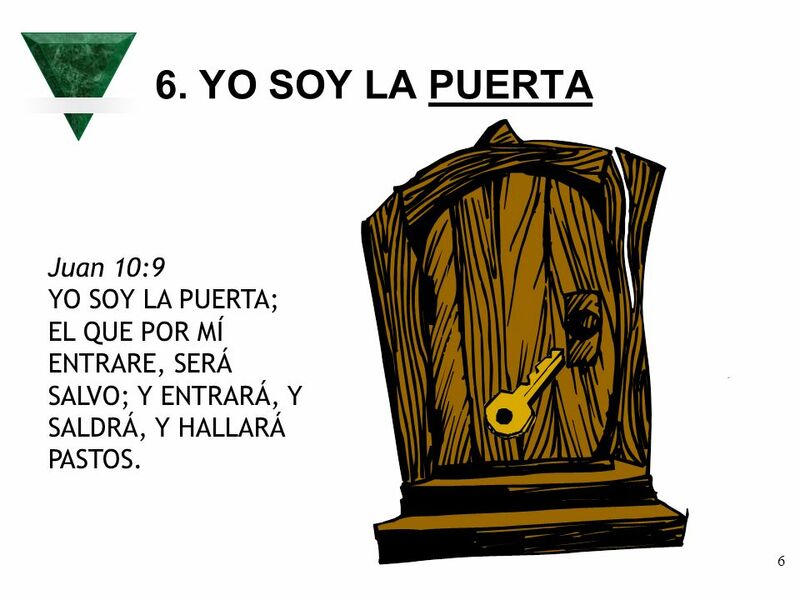 YO SOY LA PUERTA Juan 10:9 YO SOY LA PUERTA; EL QUE POR MÍ ENTRARE, SERÁ SALVO; Y ENTRARÁ, Y SALDRÁ, Y HALLARÁ PASTOS. 7 7. 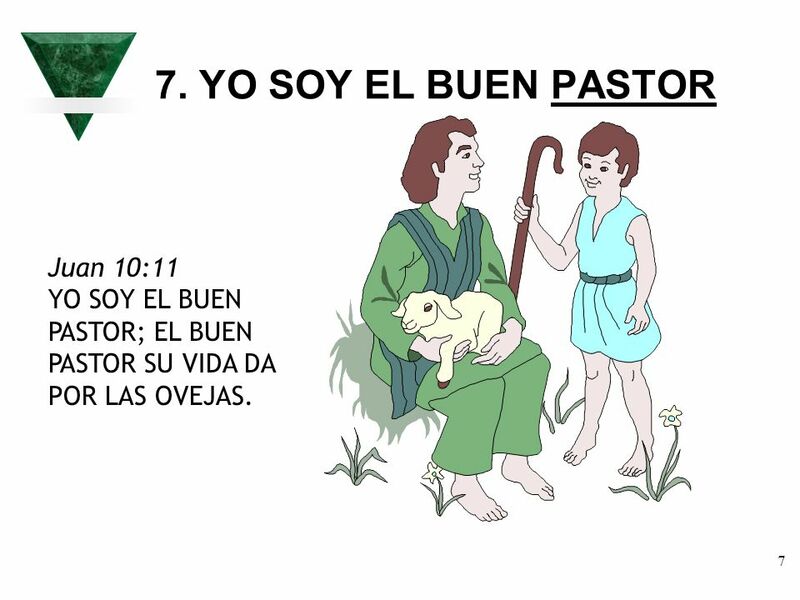 YO SOY EL BUEN PASTOR Juan 10:11 YO SOY EL BUEN PASTOR; EL BUEN PASTOR SU VIDA DA POR LAS OVEJAS. 9 9. 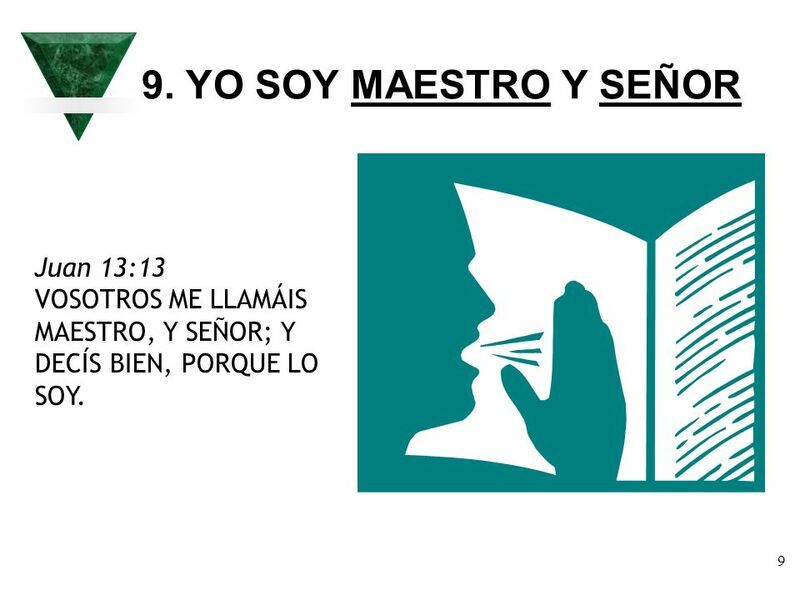 YO SOY MAESTRO Y SEÑOR Juan 13:13 VOSOTROS ME LLAMÁIS MAESTRO, Y SEÑOR; Y DECÍS BIEN, PORQUE LO SOY. 10 10. YO EL CAMINO, LA VERDAD, Y LA VIDA. 11 11. 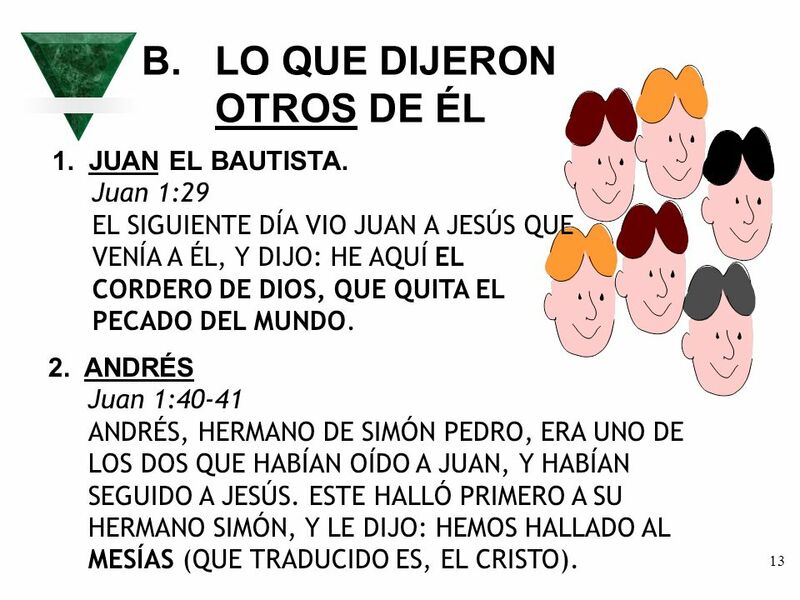 YO SOY EN EL PADRE Juan 14:8-11 FELIPE LE DIJO: SEÑOR, MUÉSTRANOS EL PADRE, Y NOS BASTA. JESÚS LE DIJO: ¿TANTO TIEMPO HACE QUE ESTOY CON VOSOTROS, Y NO ME HAS CONOCIDO, FELIPE? EL QUE ME HA VISTO A MÍ, HA VISTO AL PADRE; ¿CÓMO, PUES, DICES TÚ: MUÉSTRANOS EL PADRE? ¿NO CREES QUE YO SOY EN EL PADRE, Y EL PADRE EN MÍ? LAS PALABRAS QUE YO OS HABLO, NO LAS HABLO POR MI PROPIA CUENTA, SINO QUE EL PADRE QUE MORA EN MÍ, ÉL HACE LAS OBRAS. CREEDME QUE YO SOY EN EL PADRE, Y EL PADRE EN MÍ; DE OTRA MANERA, CREEDME POR LAS MISMAS OBRAS. 12 12. YO SOY LA VID VERDADERA Juan 15:1 YO SOY LA VID VERDADERA, Y MI PADRE ES EL LABRADOR. 1. JUAN EL BAUTISTA. 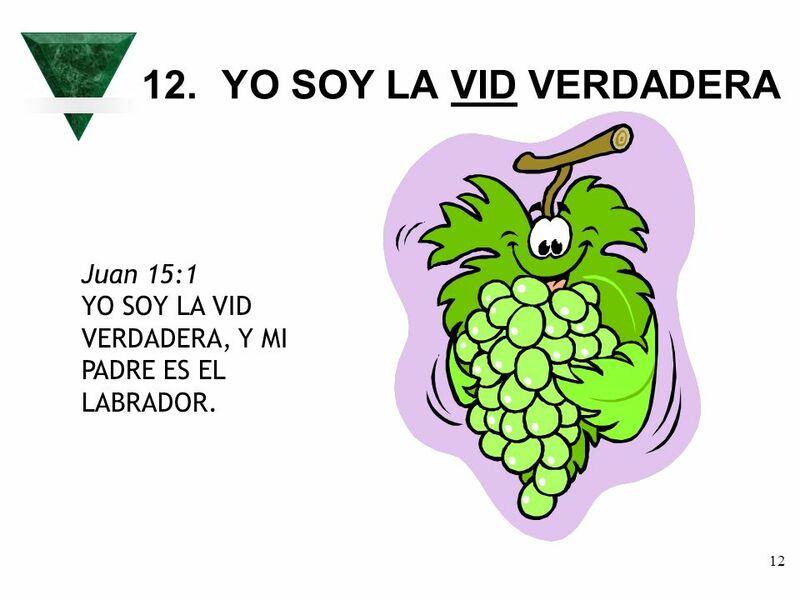 Juan 1:29 EL SIGUIENTE DÍA VIO JUAN A JESÚS QUE VENÍA A ÉL, Y DIJO: HE AQUÍ EL CORDERO DE DIOS, QUE QUITA EL PECADO DEL MUNDO. 2. 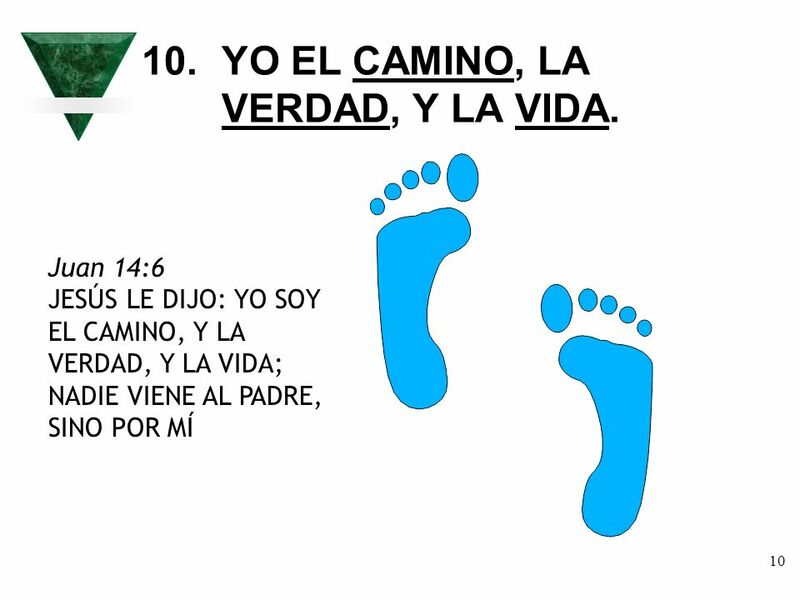 ANDRÉS Juan 1:40-41 ANDRÉS, HERMANO DE SIMÓN PEDRO, ERA UNO DE LOS DOS QUE HABÍAN OÍDO A JUAN, Y HABÍAN SEGUIDO A JESÚS. ESTE HALLÓ PRIMERO A SU HERMANO SIMÓN, Y LE DIJO: HEMOS HALLADO AL MESÍAS (QUE TRADUCIDO ES, EL CRISTO). 14 3. FELIPE Juan 1:45 FELIPE HALLÓ A NATANAEL, Y LE DIJO: HEMOS HALLADO A AQUEL DE QUIEN ESCRIBIÓ MOISÉS EN LA LEY, ASÍ COMO LOS PROFETAS: A JESÚS, EL HIJO DE JOSÉ, DE NAZARET. 4. 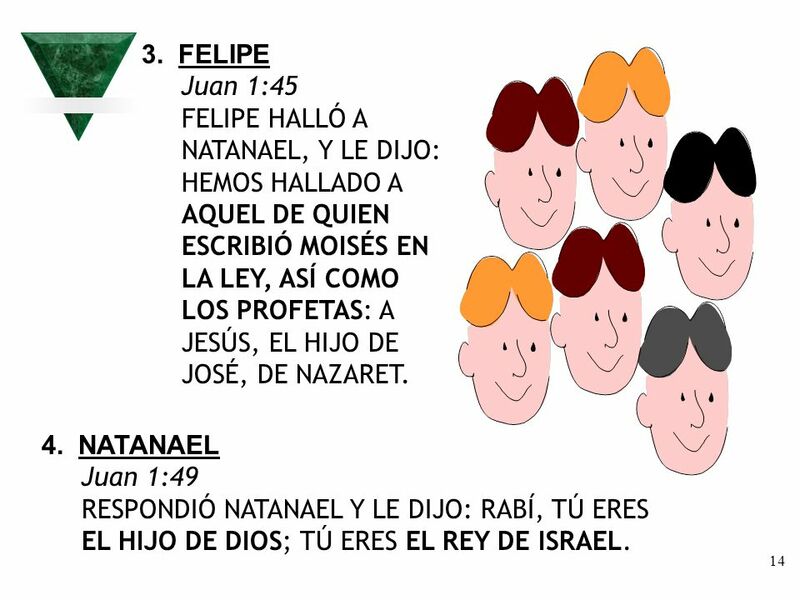 NATANAEL Juan 1:49 RESPONDIÓ NATANAEL Y LE DIJO: RABÍ, TÚ ERES EL HIJO DE DIOS; TÚ ERES EL REY DE ISRAEL. 15 5. 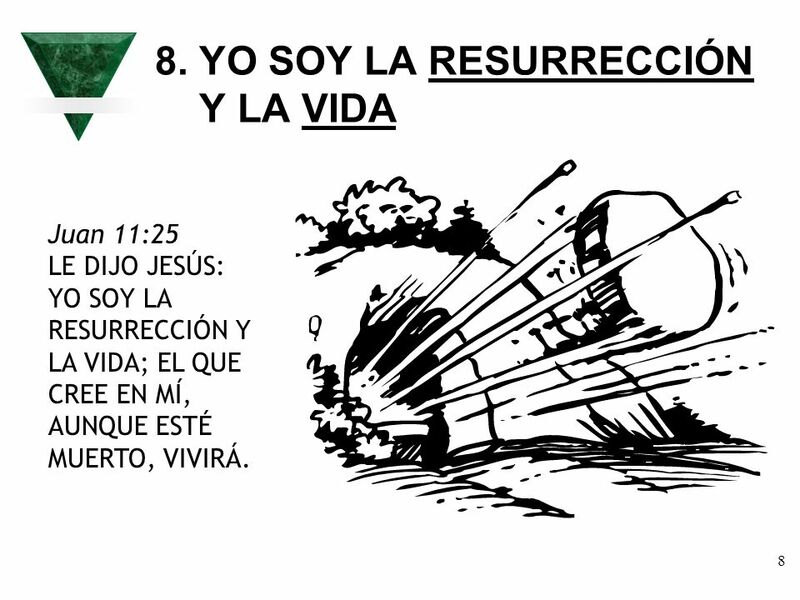 MARTA Juan 11:27 LE DIJO: SÍ, SEÑOR; YO HE CREÍDO QUE TÚ ERES EL CRISTO, EL HIJO DE DIOS, QUE HAS VENIDO AL MUNDO. 6. TOMÁS Juan 20:28 ENTONCES TOMÁS RESPONDIÓ Y LE DIJO: ¡SEÑOR MÍO, Y DIOS MÍO! 7. 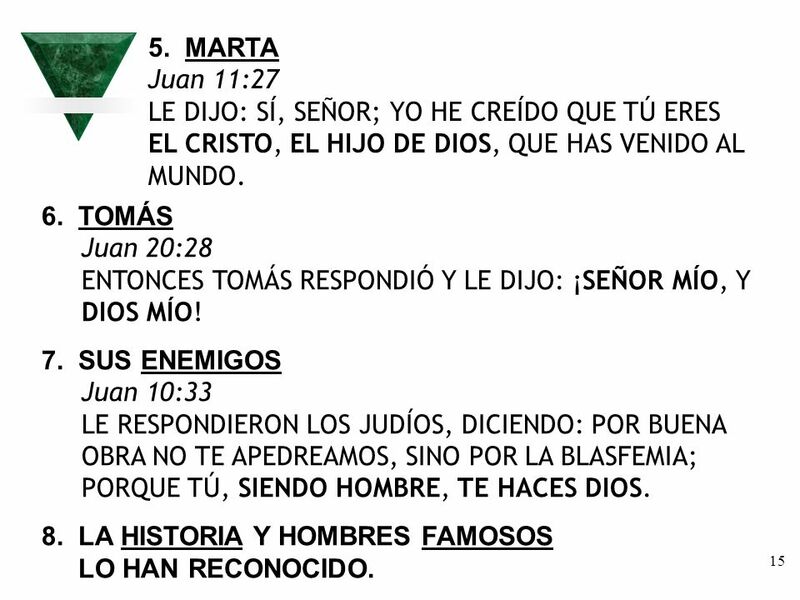 SUS ENEMIGOS Juan 10:33 LE RESPONDIERON LOS JUDÍOS, DICIENDO: POR BUENA OBRA NO TE APEDREAMOS, SINO POR LA BLASFEMIA; PORQUE TÚ, SIENDO HOMBRE, TE HACES DIOS. 8. LA HISTORIA Y HOMBRES FAMOSOS LO HAN RECONOCIDO. 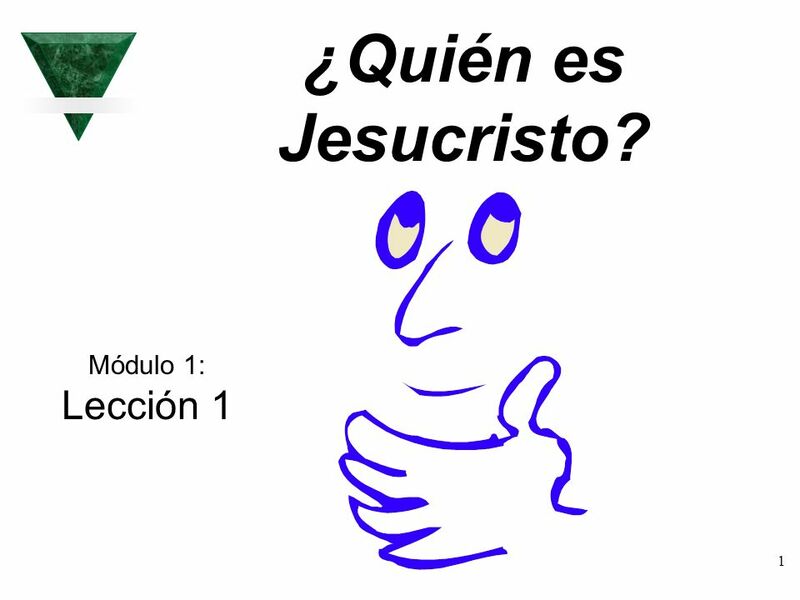 Descargar ppt "¿Quién es Jesucristo? Módulo 1: Lección 1."